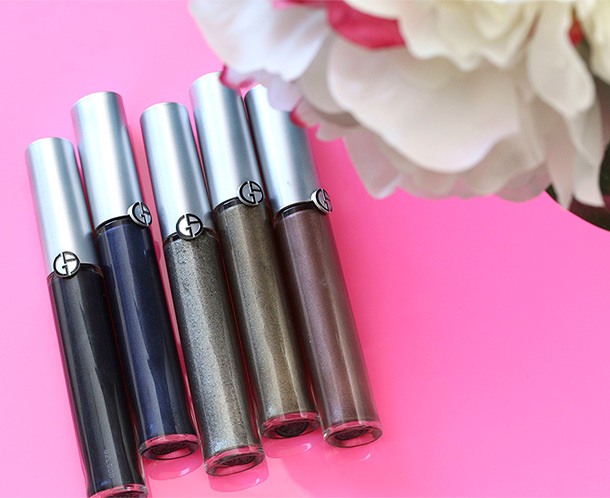 There is not a tough row to hoe when it comes to ramping up and using these new Giorgio Armani Eye Tints to create hazy, smoked-out eye looks. They’re perfect for beginners, and/or lazy people (like moi! ), and/or anyone hell bent on rocking a “smoky eye ’til I die” lifestyle. You can get a beautifully buffed cloud of hazy fog around your eyes without having to use a zillion eyeshadows. Despite the way these look in their tubes, they are not lipglosses (although I can totally see myself pulling one out of my purse at the movies in the dark). 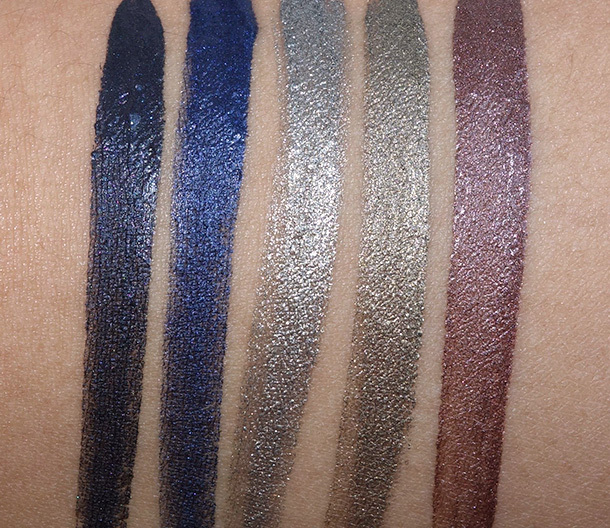 They’re actually a brand new line of water-based liquid eyeshadows that can also be used as liners. Interestingly, the formula feels like a cream (they’re thicker than Josie Maran’s Coconut Watercolor Eyeshadows) but dries to a powder finish. Truth be told, I do not want to be wearing these or any eyeshadows for 16 hours, because that would mean I’m having a very, very long day. I have worn them for stretches of eight hours, though, and yes, they stayed put without scooting around or settling into the crease…but I had to be very careful. The slightest touch lifts them right off your lids. As for the coverage, it’s quite versatile. For instance, you can easily do a solid block of opaque color using one as a liner, or sheer one out and do a smokey eye. As eyeliners! Just trace your lash line with the tip of the applicator, and then smudge out the edges with an angled brush. As straight-up eyeshadows. 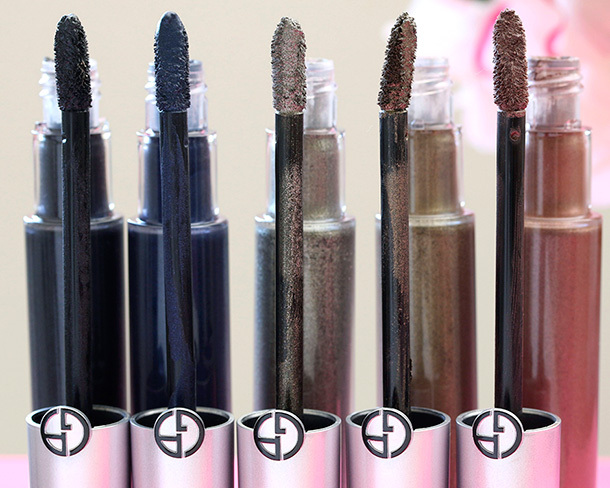 Smear a bit on your lids, then smoke out the edges with a blending brush. As a base, upon which you can layer other schtuff. 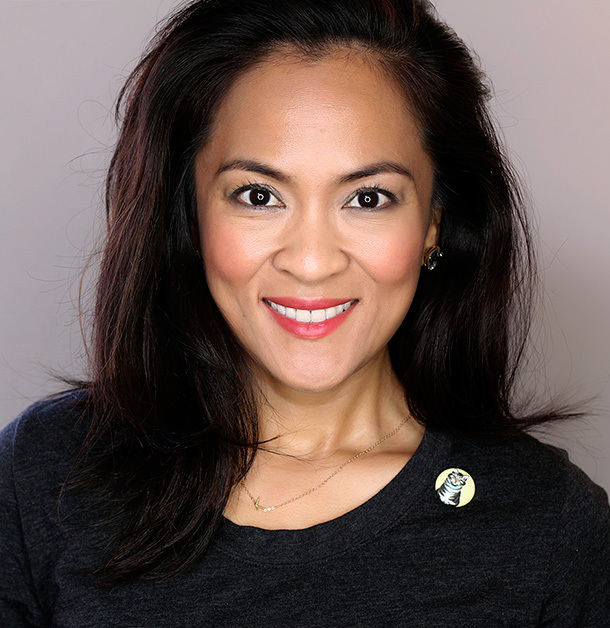 I like these for quick smokey eyes — like when I’m harried or under duress. I’ll skip primer and just swipe one on my lids with the closest eye brush and buff out the edges. Head over to the Armani counter to see all 12 shades, which come in a range of different finishes: iridescent, matte, metallic and satin. A dozen shades in a variety of await curious kitties on counters — 01 Obsidian, 02 Minuit, 03 Jade, 04 Emeraude, 05 Onyx, 06 Green Iron, 07 Shadow, 08 Flannel, 09 Cold Copper. 10 Senso, 11 Rose Ashes and 12 Gold Ashes. Lots of different finishes, too, including iridescent, matte, metallic and satin. Oh I so need Green Iron!!! That shade has my name written all over it LOL Will have to check these out ASAP! It is SO you. All you need to do is add coral lips and cheeks! I need ALL of these in my life. I haven’t been able to decide on a colour (their $40+CDN price tag forces me to be extra picky) but I’m leaning towards Green Iron and Senso. Thanks for sharing great swatches! You’re very welcome. I love both your choices. You can’t go wrong with either. I like Senso for casual weekend days and Green Iron for dressier days. Yeesh, those pigments! Obsidian is definitely my favorite of the bunch. I’ve been wearing a lot of cream bases lately and topping with powder eyeshadows. Mostly Becca Eye Tints, Tarte Seashell, and OCC Cream Color Concentrates. It’s nice to mix things up! Definitely! Plus it’s fun to play with creams, isn’t it? I love that you don’t have to worry about fallout. Hope that things on your end are a-OK, Alison! Green Iron is so pretty! Love khaki greens. I already bought Senso. I really like it (but kinda pricey!!). I think I might get emeraude next for a more flashy color and to use it as a liner. I think I am gonna buy Green Iron for my mom for her birthday. It is such a pretty color! Harried? Under duress?? You’ve convinced the entire female world to buy at least one! BTW Hourglass Color Field came = LOVE. No probs with the application. But Green Iron would be a great base. I’m very tempted but they’re a little pricey! These look beautiful. Guess which one I like the most? The purple one of course. When u say they lift off with the touch of finger does that mean they don’t ever dry completely on the lids??.. Astrid recently posted … Dupe or not, that’s the question! I like ’em! The colors are so vibrant. These are gorgeous, but for $38 a pop, NOTHING should “lift them off the lids”! fancie recently posted … Currently Obsessing Over..
I’m actually considering plunking down the money for Emeraude because it’s so amazing! I honestly think I could or should buy them all. They look SO EASY to use. I bought one of these in #9 Cold Copper. I must be all thumbs or a real hack, but I cannot get this go on as smoothly or beautifully as my favorite Nordstrom make up artist/sales associate applied it on me. I keep trying, because the color is gorgeous against my super pale complexion. I find once it’s on and dry (and I find they dry quickly on my lids) there’s no blending to be done. It’s set and locked onto my lids. I really want to figure out how to make this work with my own limited skill set, because when I do, I’m going back for more. I saw this product on another blog and feel in love bc I love liquid shadows but I don’t know if I can do $38, although the colour I like looks heavenly on you! so gorge! Thank you for showing the applicator btw. That makes a big difference in the review to me. 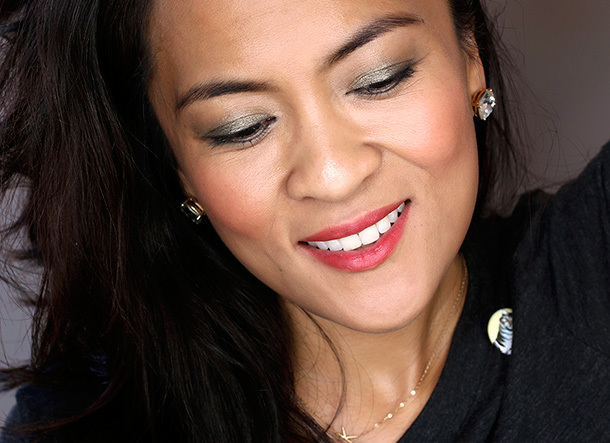 The more I look at Minuit, the more I want it and I don’t usually wear a blue shadow. Lifting off the lids, now that I don’t like at all. Does it happen with a primer because my oily lids absolutely need it? I just purchased Munuit and Emeraude and the colors are gorgeous. Even with a primer, however, the Munuit on my upper lid transferred after about only four hours. (I used it as a liner, not a shadow.) I have super oily eyelids so most shadows/liners don’t work on my upper lids. Emeraude worked well on the lower lash line, and with no transfer, no smudging, stayed in place the whole time (no primer). I am going to try using these on my upper lids without primer to see if they work better independently. A product I tried years ago from another line only worked well alone, not with primer, so I’ll have to see if that’s the case with these. Thanks for your review – it’s the best one I have seen online anywhere! You’re welcome. Have you ever tried dusting your lids with a little bit of translucent powder after applying primer? I find that on oily lids, that extra layer of powder helps to lock everything down. It also makes blending easier, too!